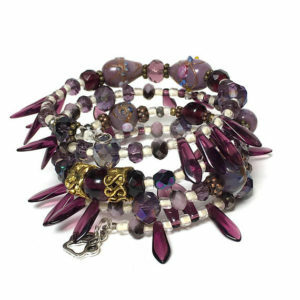 Don’t hold the name of this bracelet – Madam’s Fridge – against the bracelet which is gorgeous and dripping in purples. The name – weird – but distinctive. Maybe Madam has many grapes and its cousins in the refrigerator? One can only surmise. For February, Beading Divas bracelet sales benefit Cochise Canine Rescue in Pomerene, Arizona (Cochise County). Spread the word as this deserving rescue depends on online bracelet sales. All bracelets are handcrafted, one-of-a-kind, and made with donated beads. Bracelets cost $20, no tax. 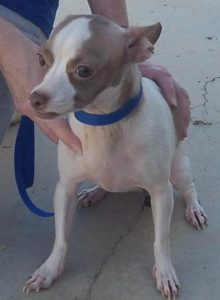 Cochise Canine Rescue receives $18 for every bracelet sold online. Postage is based on destination. Please note: Bracelets on Etsy have already been photographed, uploaded, wrapped and labeled. What’s on Etsy stays on Etsy until someone buys it via Etsy. You cannot pick up an Etsy bracelet anywhere because the fulfillment is done by volunteers in private homes. If you like it, buy it – one of a kind — or someone else will buy it..
From the Feedback File: “Beautiful bracelet. I’m sure my friend will love it. Thank you so much and thank you for supporting all the precious dogs in the world.” ~~Joy N.
*Adoptable: Gigi is house broken, kennel trained, spayed and up to date with her shots. She does the cutest thing at night: she pulls her covers over herself in her crate at night.